This beautifully renovated beach house ticks all the boxes for a superior island holiday. Situated just above the beach and a few minutes walk from the village, this property has all the advantages of central positioning, but with the privacy and tranquility of a secluded location. 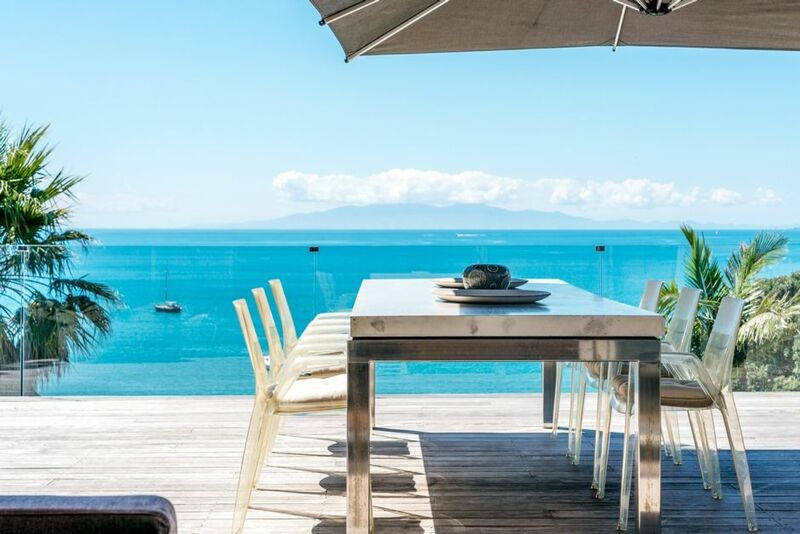 And it boasts sensational views from the generous deck out over Oneroa Bay – this is a very special spot! The house is beautifully furnished and boasts spacious living spaces and a well-equipped new kitchen. There are two outdoor eating areas – on the front deck, overlooking the bay, and – at the rear – a sheltered space with a 4-burner barbeque. In addition there are 3 bedrooms, one of which can be divided into two by a sliding door, and 2 bathrooms. A 15 minute walk from the passenger ferry, and 2 minute walk down the local path to Oneroa beach, make this house a pedestrian’s dream. Should you want to explore further afield, regular buses leave from the village. There is even a great cafe immediately at the top of the drive (which as well as being very convenient for coffee and brunch can also mean some morning noise). The property is not to be used for any large parties or gatherings. We loved our stay here. Well appointed and set up. Views are just incredible. Comfortable beds in the two main rooms. Bunk room is less comfortable and you can hear the noise from the cafe in that room from about 730am. But overall this did not detract from our stay. Thank you! Marvellous. Fantastic location and view of Oneroa Bay. Extremely well and tastefully equipped. Stunning position above Oneroa Beach. We have recently had a family weekend at Waikare over a long weekend to celebrate a significant birthday. We were delighted with both the position overlooking Oneroa and the facilities within the house which for 6 adults of varying ages and a 5 year old child worked extremely well. We would definitely stay again. Amazing house with stunning views and so close to Oneroa Village . We loved it ! Only negative was our car scraped on the the top of the driveway when we arrived ,so we had to leave it on the road for our stay, otherwise highly recommend . Amazing property and the view is just incredible. Amazing property and the view is just incredible. Really spacious entertaining and bedroom areas. Comfortable beds. All in all had a really great stay. Would highly recommend. The place is lovely, modern, clean with fabulous views and location. The place is lovely, modern, clean with fabulous views and location. The only reason I haven’t given it top marks is that although we were aware there was a cafe at the top of the drive away nowhere did it state this place is attached to the back of it. The cafe is only open 8-3 but you could hear people walking around and chairs being moved. If you were a light sleeper in the bunk room it could be a problem.